John Pollock and Wai Ting discuss recent reports of The Revival and Mike & Maria Kanellis requesting their releases from the WWE. Plus, Chris Jericho dishes details about his AEW deal on his latest podcast. 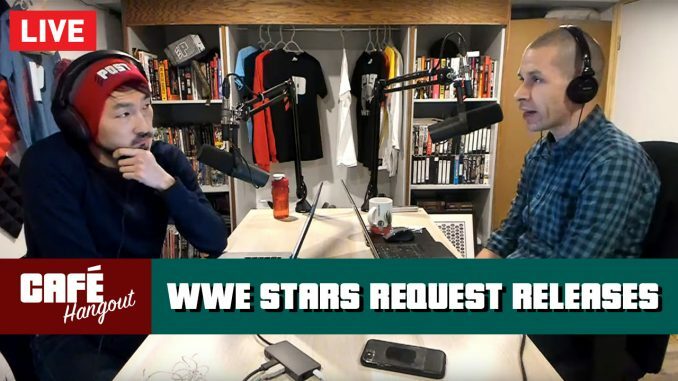 We’re joined by callers discussing the lack of women’s wrestling in NJPW, Becky Lynch’s role following the Royal Rumble, Kenny Omega and other free agents, rumoured WWE arrivals, and POST Wrestling being named one of blogTO’s 50 Toronto podcasts you should be listening to. Café Hangouts are recorded live every Thursday. Patreon Double Double, Iced Capp and Espresso supporters have the opportunity to watch and interact live each week.